Trump says Chinese leader 'helpful' on Kim Jong Un meeting - Integration Through Media ....! WASHINGTON, (AFP): US President Donald Trump said Saturday that China’s President Xi Jinping is being “helpful” as the United States moves toward a summit with North Korean leader Kim Jong Un. Trump gave few details in a tweet about his telephone conversation with Xi Friday, but the White House had said the two leaders committed to keeping the pressure on North Korea until it takes “tangible steps” toward denuclearization. 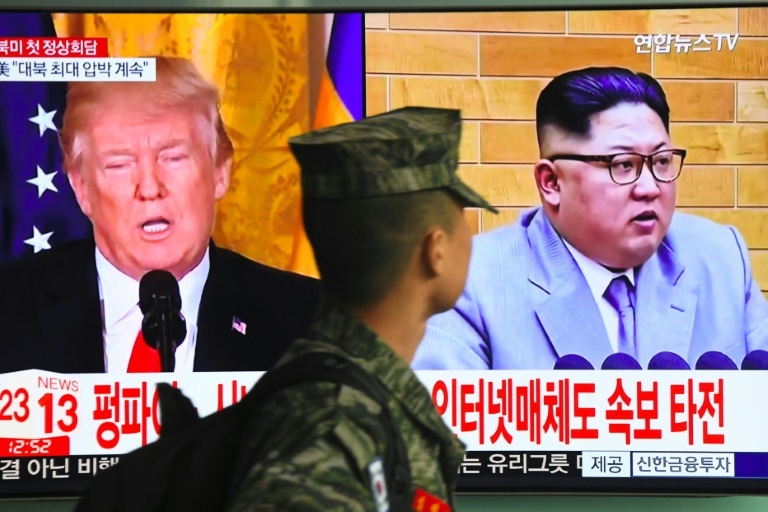 Trump stunned the world this week by accepting an invitation to meet Kim before the end of May, an unexpected turnabout after months of intensifying brinksmanship that sent tensions soaring. In another tweet Saturday, Trump said Japan’s Prime Minister Shinzo Abe also was “very enthusiastic” about talks with North Korea. Trump praised a possible future agreement with the communist North as “very good” for the international community as a whole in a Friday tweet. “The deal with North Korea is very much in the making and will be, if completed, a very good one for the World. Time and place to be determined,” Trump wrote. North Korea’s ambassador to the United Nations, Pak Song il credited the turnabout to Kimm’s “broadminded and resolute” decision to contribute to peace and security in the Korean Peninsula. As aides scrambled to catch up with Trump’s decision, taken before consulting key confidantes, the White House sent mixed messages about conditions. “They’ve made promises to denuclearize, they’ve made promises to stop nuclear and missile testing,” White House spokeswoman Sarah Sanders said. “We’re not going to have this meeting take place until we see concrete actions that match the words and the rhetoric of North Korea,” she told reporters. Officials behind the scenes said this did not constitute a change of heart. In the Hague, former secretary of state and Trump rival Hillary Clinton questioned the administration’s readiness for the diplomatic challenge ahead. “If you want to talk to Kim Jong Un about his nuclear weapons you need experienced diplomats,” Clinton told Dutch tabloid Algemeen Dagblad in an interview published Saturday. She said the State Department was “being eroded,” and experienced diplomats on the North Korean issue were in short supply because many have left. “It’s a real opportunity… I worry about the president’s unpreparedness and lack of discipline. But I commend him for his very bold move in accepting the invitation,” Richardson told AFP on Friday.